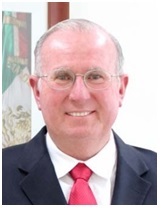 Chairman – Francisco Javier Mendieta-Jimenez, Ph.D.
Francisco Javier Mendieta-Jimenez is the General Director of the Mexican Space Agency. Prior to his appointment, he was involved in development projects on applications of optical fibers to electrical power systems at the Institute for Electrical Research, Mexico. Mendieta-Jimenez previously served as Director of the Applied Physics Division and General Director of the Center for Scientific Research and High Education of Ensenada, Baja, California (CICESE), where he formed the optical communications group and laboratory and lead diverse research and development projects on optical telecommunications, free space optical satellite communications and detection. He was a candidate astronaut for the Space Shuttle program, and leader in CICESE of the SATEX 1 Project, which was a coordinated national effort to develop human resources in space sciences around a microsatellite project. Mendieta-Jimenez has a bachelor’s degree in Mechanical and Electrical Engineering from National University of Mexico and his Certificate of Higher Studies and Doctor of Engineering degree from the National Superior School of Telecommunications, France, in the field of Optical Telecommunications.